Mason Deja, INHS seasonal technician, holds a common carp from the Illinois River. CHAMPAIGN, Ill., 2/28/18: As common carp forage in Illinois River sediment, they eat and scatter seeds of both beneficial plants and invasive species. 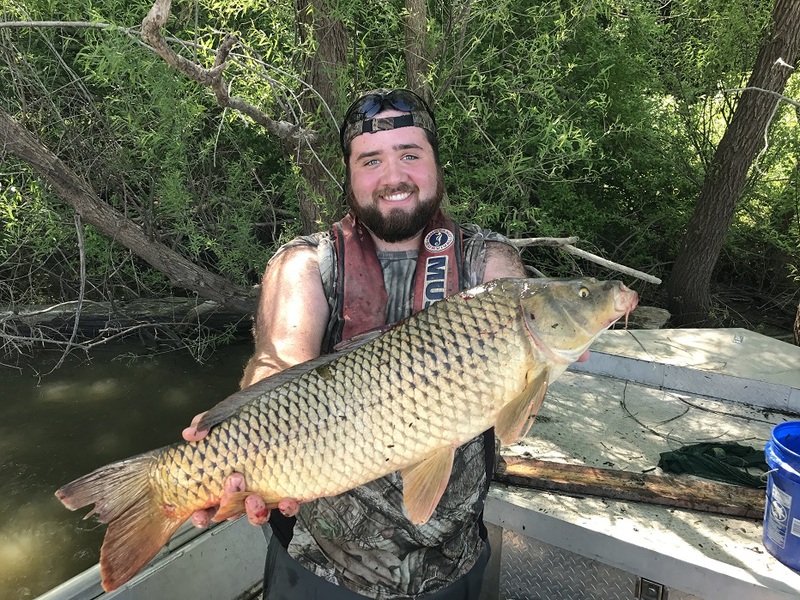 A new University of Illinois (U of I) study indicates that the particular seeds that carp consume and the distance at which they shed them could potentially alter the river ecosystem. Researchers from the U of I’s Illinois Natural History Survey (INHS) collected 92 common carp from the upper Illinois River and found that along with vegetation, mollusks, snails, and worms, they ate 42 types of whole plant seeds. Since carp tend to migrate, they spread the seeds in other parts of the river where seeds could grow. Common carp are known to help degrade the river ecosystem because they root in sediment while foraging, muddying the water so that less sunlight reaches aquatic plants. This study showed that they also spread seeds of undesirable plants that can outcompete those native to Illinois. One example is the water hyacinth, which grows quickly, crowds out native aquatic plants, and is difficult and expensive to control. Thus, the potential for common carp to disperse these seeds, which were found in the carp diets, could compound the problem of the spread of invasive species. “If carp disperse native plant seeds, that is a good thing, but our study showed that they also consumed seeds from invasive plants, which is not beneficial for the ecosystem,” DeBoer said. The study also found that the fish consumed wild celery seeds at rates greater than expected by random chance, indicating they may choose these seeds. Alternatively, it might mean that fish choose the wild celery beds as a refuge from predators. Either way, carp removing the wild celery seeds from the environment has important implications, said Jay VonBank, primary author of the study and PhD student at Texas A&M University-Kingsville. Wild celery seeds are a potential food resource for waterfowl. Historically, wild celery was abundant throughout the entire Illinois River system, but presently it is known to occur only in the upper part of the river. The study was published in the Journal of Freshwater Ecology, and was funded by the U.S. Fish and Wildlife Service.